2018 Wilson A2K Catchers Mitt Review – Longest Lasting in Baseball? Pitchers have it easy when it comes to picking a baseball glove. Really, you just need to make sure the web covers the ball so the hitter doesn’t see the grip, and it should be light enough so they can intercept a fast comebacker. It’s a different matter when you’re choosing a mitt for the catcher, as the wrong choice can spell disaster for the catcher’s hand. The importance of this particular glove for a catcher is why the Wilson A2K Catcher’s Mitt is so important. As a catcher, you’re dealing with lots of high-velocity balls throughout the game, and that can be hell for your hand. That’s why you need to have heavy padding to protect your hand from the pounding. It must be tough and durable, yet it should also be light enough that you can wear it comfortable and move it easily to catch pitches. Finally, it should be easy for you to transfer the ball to your throwing arm so you can pick off base runners trying to steal a base. All these requirements bring us to the Wilson A2K Catcher’s glove. 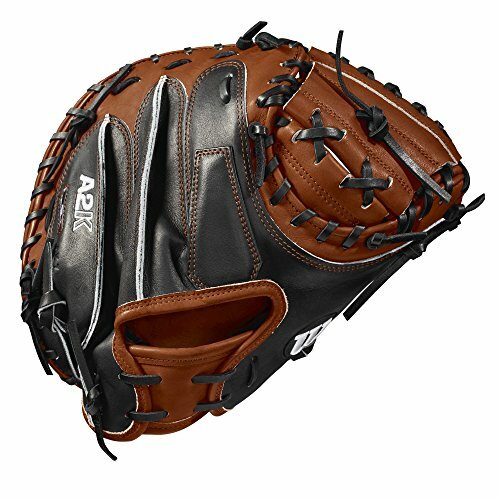 We are talking specifically about the new Wilson A2KRB17M1 catcher’s mitt, which is an upgrade from earlier models. It’s perhaps the highest quality glove that you’ll see from Wilson, and that’s apt since you demand the most from this type of baseball equipment. This glove is of undeniably high quality, and it’s a worthy bearer of the hallowed A2K designation. It retains most of the superb features of its predecessors, though it comes with a few upgrades this year. It’s designed for adults, though large teens can make full use of it. Perhaps the most notable change from previous model is the size of the mitt. As every baseball fan knows, mitts tend to be larger than regular gloves because the player stays mainly in place. The primary use for the mitt is to catch a fast ball thrown their way. A larger mitt makes for an easier catch, which is why first basemen tend to use larger mitts than other infielders as well. Most adult catcher’s mitts are at least 32 inches in size, and the previous A2K model measured in at 32.5 inches. Now this one is a full inch larger 33.5 inches. That provides a bigger basket pocket for the pitches, and that makes for fewer passed balls. Does it Have Quality Webbing and Leather? This also features a half-moon web. This is for added durability and helps with tough scoops when dealing with the pitches. Then there’s also the top of the line Pro Stock Select Leather. Wilson is one of the premium brands in all of baseball. To protect their reputation they choose only to work with the best quality leather they can find. But A2K is the top of the line model in the whole Wilson baseball glove lineup. It’s their best of the best, the cream of the crop. That’s why for their A2K gloves and mitts, they use only the top 5% of all the excellent leather they’ve decided to use for their gloves. Imagine that all baseball leather is rated for quality with a grade from 1 to 100. Wilson only works with high quality leather for all their gloves. You can estimate that they use only leather with a grade of 90 and above. But for the A2K catchers mitt, the only glove leather they use has to have a grade of 97.5 or above. That’s how much quality they put into the glove. What About The Palm, Padding and Break-In? Here you will also see the Double Palm Construction feature. This refers to the thin piece of leather that’s been specially designed, cut, and placed between the palm liner and the outer shell. The R & D department at Wilson has figured out that this feature helps boost the stability of the pocket so that the ball stays secure inside when you catch it. This also improves the shock resistance, which is crucial for the health and comfort of your catching hand. It adds to the tough padding so that you don’t end up hurting your hand soon after you start catching fastballs. It also keeps the leather in the palm from wearing down prematurely because of all the pitches you’ll catch in your games. That means the mitt itself will last much longer. In the factory, the Wilson expert craftsman also gives a lot of attention to the shape of the mitt. In fact, they spend 3 times longer for the A2K models when it comes pounding and shaping the mitt. What this means for you in practical terms is that the break-in period is much shorter. There will still be a break-in period, of course, but that’s necessary so that the mitt molds to the particular shape of your hand. But at least with the extra time devoted to pounding the mitt properly in the factory, the craftsmen also ensures that the glove will end up with the ideal pocket structure that catchers need. That’s not always assured with other catcher’s mitts that need a much longer break-in period—sometimes they end up with the wrong shape. 2018 Wilson A2K M1 Why waste gas and stress in traffic around town when you can buy this from the comfort of your home? If you are part of “Prime” you can get this glove in two days flat! It’s perfect for any player of any level who uses a 33.5″ glove. Wilson is the Official glove of Major League Baseball. Try this glove and be like the pros. Another terrific feature in the A2k catchers mitt is the rolled dual welting. This is the thin strips of Pro Stock leather are skived thin and rolled. These go along the fingerstalls of the mitt all the way to the fingertips. With the extra pre-shaping in the factory and the rolled dual welting, this mitt will retain its shape for a much longer period of time. Even the catcher’s comfort is addressed as well. Mitts of this sort can leave hands sweaty, and that’s solved by the “Dri-Lex” wrist lining. This material wicks moisture and it’s extremely breathable, so you don’t have to endure a sweaty palm that can distract your concentration and ruin your catches. It’s also made in Japan, which is the same place where they make the gloves for the MLB pros. In contrast, the A2000 counterparts are made in Vietnam. This is the flagship of all the Wilson gloves, and it’s a real beauty. That’s even literally true with the blonde and black color combination. Its looks like a serious piece of game equipment, and it plays like it too. The pocket is very stable, so that the balls come in the pocket and they don’t come out. That means fewer passed balls that may allow runners to steal bases or even head on to home safely. The larger pocket makes catching pitches much easier. The large size of the mitt funnels the ball right into the pocket. Again, that means fewer passed balls. This is a very durable glove, as Wilson has chosen to use only the toughest and most premium-grade leather. This means this can last for a very long while. That’s not something you can say for most of the other catcher’s mitts, since these things are used a lot during a game. That tough and durable leather could’ve have taken a lot of time to break in, but at least the Wilson craftsmen have spent a lot more time pre-shaping this. It shortens the break-in period considerably, and you’re more assured that you end up with an ideal pocket structure. It really protects your hands too, and your hands are also comfy during gameplay. Nothing is really perfect, and the same rule applies for the Wilson A2K Catcher’s glove. It’s a bit expensive. This is perhaps the main reason why some people may not like it—it’s because they can’t afford it. You have to understand that this is the best of all the Wilson’s gloves and mitts out there, and premium quality comes at a premium cost. It can be tough to use at first. The main challenge here is to practice getting a secure squeeze on the ball. You have to take into account that the leather used here is the toughest and most durable, so they’re not very soft and therefore not easy to squeeze. Then this model is even larger, which makes it even more difficult to get a good squeeze on the ball. So you will need to save up for this mitt, and then you’re going to have to break it in nicely so that you can get a good squeeze on the ball. Do you want the very best catcher’s mitt? That’s the only question that matters here, because by all the standards that matter this is among the best mitts you can use today. It’s tough, has a deep and stable pocket, easy to break in, and even comfy to use. It will protect your hand and enhance your play. It even looks terrific. 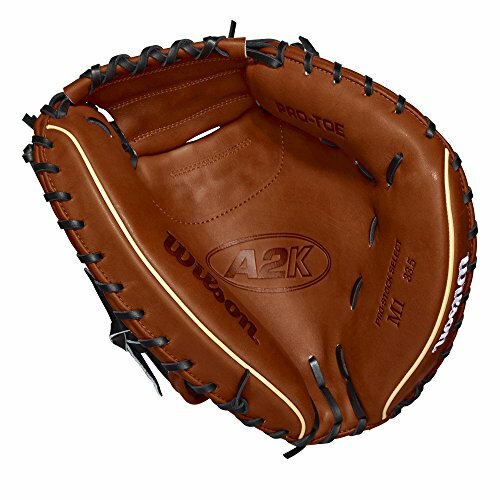 Baseball becomes more fun and winning becomes more frequent with this terrific Wilson A2K Catcher’s Mitt and lots of practice. Want this pro style glove in two days or less? Wilson A2K DP15 Baseball Glove – Is It Worth the Price? Wilson Baseball Gloves – Built To Last The Whole Season?